The Mikrotik RB2011UiAS-RM has an SFP cage for gigabit SFP transceivers and is an ideal solution for FTTH (Fiber To The Home) implementations. It’s powered by the new Atheros next generation 600MHz 74K MIPS network processor and has 128MB of RAM, and a Level5 RouterOS license. RB2011UAS-RM comes in a rack mount case. 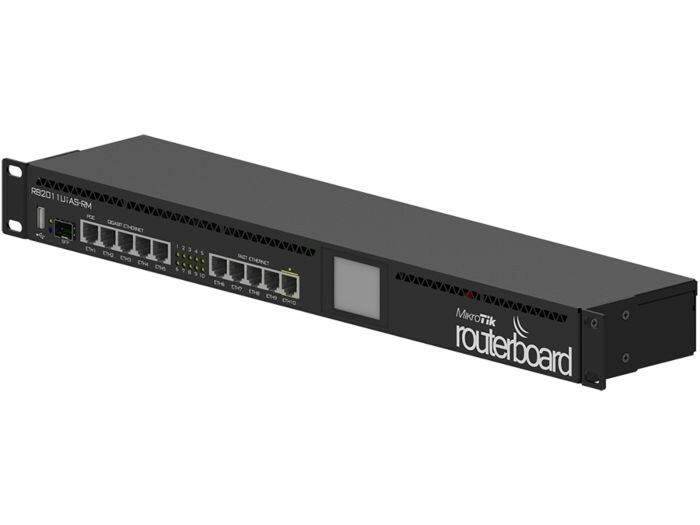 The Mikrotik RB2011UAS-RM has 11 ports: Gigabit SFP cage and five Gigabit Ethernet ports that can be switched together providing affordable wirespeed Fiber-to-Copper converter, and additional five Fast Ethernet ports. Board can be powered by power jack or PoE. Mikrotik RB2011UAS-RM supports any 1.25G SFP transceivers that is within the SFF Committee specifications for SFP Transceivers. RB2011UAS doesn’t have hardware support for PON (Passive Optical Network) - this hardware support MUST be implemented on SFP transceiver itself. Note that the SFP transceiver is NOT included.